Please enter personalization exactly as you want it to appear. This poplar wood wedding keepsake chest measures 18" x 11.5" x 11.5" outside and 15" x 8.5" x 9" inside and is perfect for storing all of your precious wedding memorabilia. 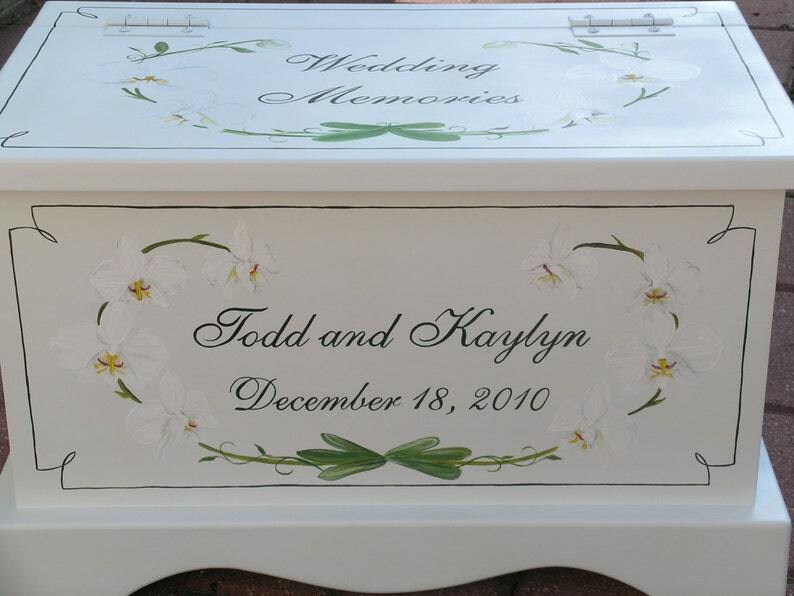 Each chest may be personalized with your names and wedding date. This design is hand painted with a white orchid design. Custom colors are available. Chest has a fabric lined bottom and an acid free envelope on the inside lid for storing paper memorabilia or photos. Well worth buying. I have bought one for 6 granddaughters and one grandson. Excellent quality and unique for each child. This is a really special baby present. The work is professional and always is well received by new parents (I have purchased at least 3 so far). The personalized touch adds a real sentimental value! Loved it! The keepsake memory box is the perfect accessory to my son’s nursery. Very well handcrafted and was delivered in a few days upon receipt of purchase. No returns or refunds on personalized items. Returns accepted only on damaged merchandise by UPS in original packing WITHIN 30 DAYS OF RECEIPT OF MERCHANDISE. If you receive a damaged item, please message us immediately and DO NOT THROW AWAY packing material. UPS will only accept returns with all original packaging materials. You must contact us regarding any damaged merchandise within 30 days of receiving your order - no exceptions.